Why Living in a Historic Town is a History Nerd's Dream! ~ Learn, Live, and Explore! Why Living in a Historic Town is a History Nerd's Dream! Today, I was reminded why I made sure I found a way to finally live in historic Alexandria, Virginia. I saw a news report yesterday in the Washington Post about a construction crew discovering the remains of the port side of a ship that dates back to at least the late 18th century. It is still early to know the exact details of the ship's historical purpose, but it's location is telling. When George Washington did his survey of the City of Alexandria in 1749, at the top of this post, you can see that a concave cove existed where today's waterfront is located, extending from the end of Duke Street to the end of Oronoco Street. 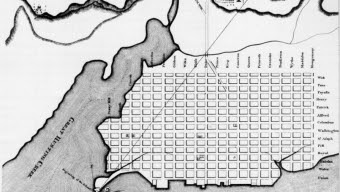 Before a District of Columbia even existed, Alexandria was the area's largest city -- a major international shipping port, in fact, because of the deep water channel in the Potomac River that allowed entry for larger transatlantic vessels. Unfortunately, that depth did not extend into the Alexandria cove. 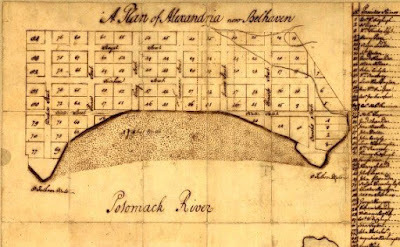 In the late 18th century, between 1775-1798 with most of the work being done post-war in the 1780s, the bluff you can see in the drawing above was graded in order to extend the land into the river, as seen in the 1798 map below, and make wharfs to aid in the international trade activity. To support this landfill, other debris needed to be added to the dirt. Early speculation is that this ship was scuttled as part of this land expansion project. The wood has remained in its well preserved state because it has been submerged in wet sand, at approximately 3 feet below sea level. 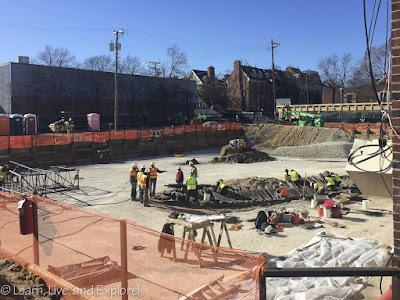 It was only when the construction crew piped out the water in the foundational hole they were digging for a new hotel that the ship remains emerged. 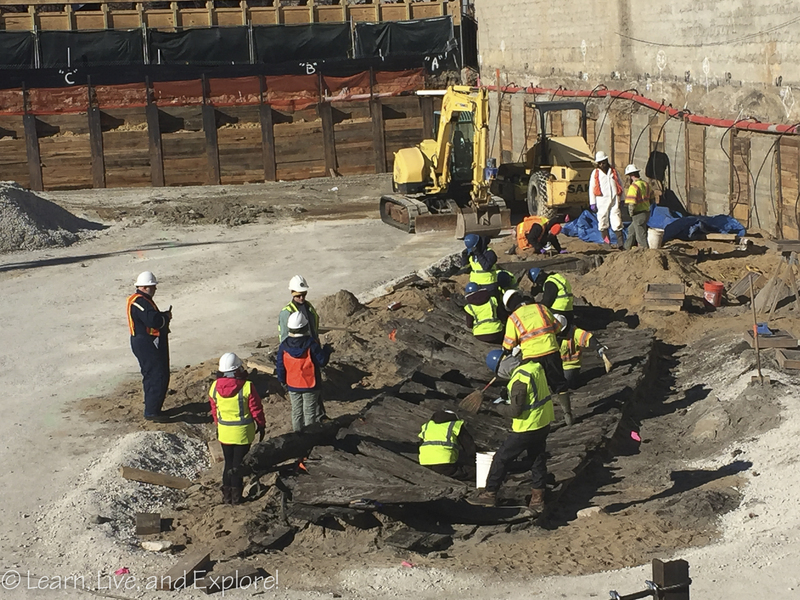 Construction crews were not surprised when they uncovered another item from Alexandria's past, but the significance of finding a ship is great for researchers. 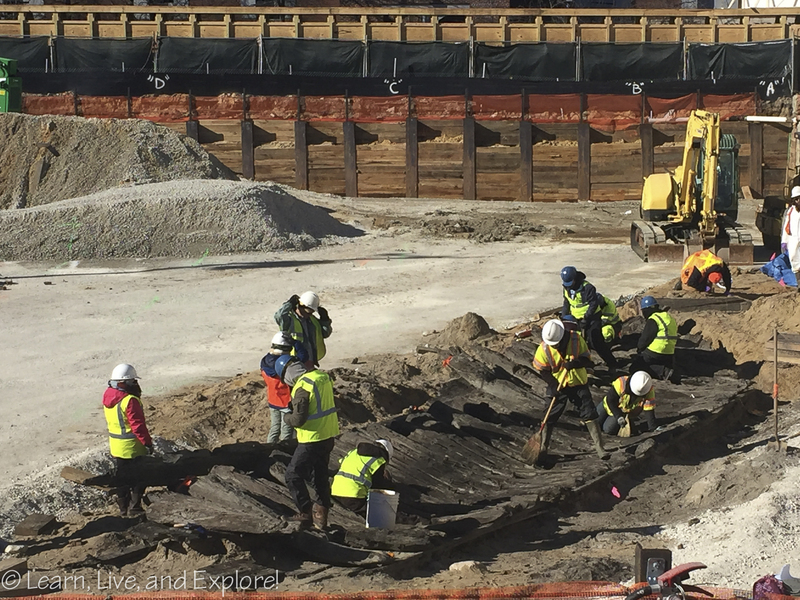 Navy archaeologists have indicated that this is an unusual find with the potential to gather important information about how the ship was constructed. The futtocks are close together, which may indicate the ship was a military or coastal ship able to carry heavy loads. Evidence exists, such as axe markings, to suggest the ship was taken apart to accommodate the banking out of the land. The discovery of the ship remains is the third archeologically significant 18th century finding on the site. 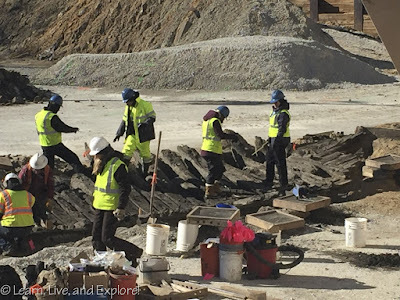 The crew has also discovered a pair of privees, the contents of which will be excavated for objects, as well as the foundation, large wood timbers, framing, flooring, and walls from a known warehouse from that time period. This warehouse was erected in 1755 by the Trustees of Alexandria, under the oversight of John Carlyle, to serve as a public warehouse at the end of Duke Street (Point Lumley). The developer of the property was required to hire archeology consultants for the duration of the removal of existing buildings and ground area in order to ensure that anything of historical significance found on the site was documented. In addition to the 18th century findings, they have also unearthed remnants of an old fertilizer factory. 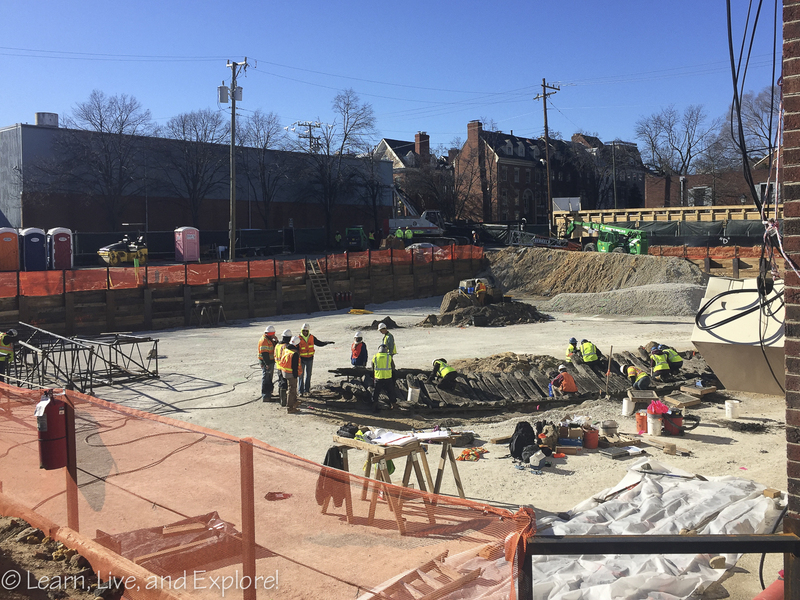 It's not often that parts of Alexandria's historic waterfront get overhauled to this extent, so residents and fellow history nerds are excited. You can follow the progress of the archeological research and findings here.